This page is a collection of Financial effort estimations. It covers all planning, preperations, material, transport, administration, etc. Funding is needed to make the colonization possible. Here the mass of the person with an average of 70 kg is only part of it. Additional mass is calculated for the life support systems. Rockets must be man-rated for them to be used in manned transportation to space. USA, Space Shuttle: A partially re-usable manned transportation system. Cost estimates range from $100 million to $1 billion per launch. Russia, Soyuz-TMA :A robust module in its fifth generation of Soyuz-spacecraft. Cheaper than the Space Shuttle. China, Shenzou: The Chinese manned spacecraft, 3 manned flights have been launched. USA, SpaceX Dragon: An upcoming manned spacecraft, the first by a private corporation. 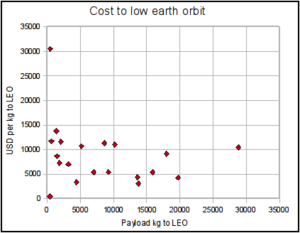 Might enable cheap manned access to orbit by the SpaceX rockets using the Falcon9 rocket. Cost: $49.9 million, plus a Dragon module (cost unknown atm). USA, Orion spacecraft: Will be using the new Ares I rocket, and will replace the Space Shuttle. USA, SpaceShipThree: A possible orbital spaceplane by Scaled Composites. NewScientist 2004: "A human mission to Mars is expected to cost $40 billion to $80 billion." 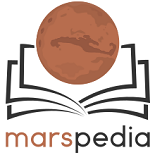 MARS DAILY 2007: "U.S. experts estimate the cost of a manned mission to Mars at $500 billion. Russia believes it can place cosmonauts on the planet's surface in the next 12 years for just $14 billion, ..."
Mars One is planned to cost "six billion US dollars". These huge differences are the result of different mission targets - simple mission of flying to Mars and back (plans by Roskosmos (Russia) - similar to lunar Apollo program) is far more cheaper than permanent setlement or even NASA expediture mission (staying 90 days or about year). Expensivness of current NASA mission plans mostly comes from the fact, that they includes LEO, Moon base stages with 3+ subsequential flies to Mars, with manned ~600 day stay. This page was last edited on 17 December 2018, at 23:56.